How to carry a pint size 380? Of have both, options are good. I agree. I like options. If you can afford it, it makes sense to have a variety of handguns. There is nothing wrong with having LCP sized, Shield sized, and Glock 19 sized guns. After that, I’d throw in a 642 or LCR and a GP100 or 686 revolver, and a Mark IV .22 target pistol. This is how people end up with twenty or more guns isn’t it? So what you’re telling me is that once I pick up a j frame my handgun collection will be complete and I won’t need to buy any more handguns? Please don’t tell my wife. Tiny .380s have their place. My LCP is in my pocket (in pocket holster) as I lounge around the house this lazy Saturday morning. I think pockets and ankles are the place for these guns. IWB seems like overkill for the LAP sized gun. Small 9s like the LC9, G43, and Shield as well as .38sp revolvers also work for pockets and ankles. IWB also makes sense with this size of gun. Anything bigger (like G19, M&P, XD, SR9) should be IWB or OWB. This is the one I use. No one has ever noticed it. I can carry my Springfield XDs .45 ACP just about anywhere I can carry my S&W .380BG. The differences come into play when weather and clothing make the extra weight of the .45 pistol print or reveal itself with sagging if worn in a pocket holster. When I can use my IWB holster it’s always my .45 as my primary. My S&W M&P 40C is also a great choice and has night sights. My Ti-Lite .38 SPL +P is my usual backup. If not for carrying it daily for the last 17 years or I might forget I had it with me it’s so light and easy to carry. Whatever you choose…. train properly again and again and again……. IWB single clip carry for things as small at the LCP can be problematic as is too small and does not provide enough gun behind the belt to support it unless you really tighten up you belt. If you are going to carry IWB single clip it has been my experience that you really need a longer barrel to keep the gun tucked into the body. I carry my CW380 OWB. With dark pants, black leather belt and holster with a black T-Shirt it is hard to spot even if my carry garment hikes up. Or I carry in a back pocket wallet style holster. Not the one that covers the lower half of the gun, but the typical in the pocket with a peace of rectangle leather on the outside. I like this as it positions the gun and it will not move. Also, if you don’t want to sit on it, you can move it to another pocket even in plain sight as it looks just you are moving your wallet. greek for “double proposition,” it’s a problem offering two possibilities. even still, having a plethora of options hardly presents one. this is one of the most catered to subcompacts. 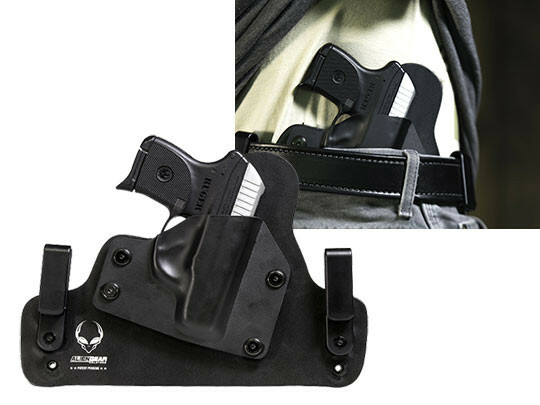 get a single clip iwb, a good front/ cargo pocket holster and maybe an ankle biter for other situations. If you are looking for a very slim leather iwb holster that will hold you lcp in tight then I’d suggest the azula. If anything it sits a little low in my opinion but it does conceal the tiny lcp like nobodies business. Unless I pick something up way over my head and someone catches the perfect angle then you’d never know. I actually find myself carrying my lcp iwb even in PJs to let the dog out or waiting for my coffee to brew. So much better than sitting down and having the pocket holster and pistol fall out on the couch when it flops out of loose pj pockets. Funny, when I googled Azula, I got a bunch of cartoon characters/avatar something. I narrowed my search after 5 pages of Avatar cartoon stuff. I made my own Kydex back pocket LCP holster with a spare mag port. The gun clicks in place due to the custom molding and the pocket catch and grip tape keep it in the pocket on draw. The whole thing is wallet sized, sits low in the pocket and is has been no problem to sit on in an office environment. It is the best option for ultra-concealment. I have considered selling them. LCP in pocket Nemisis mostly. In sof tuck some. PPS M2 IWB Kydex or Remora. It can go in a few pockets, but not well. I like my Recluse holster. Looks like a wallet in my back pocket. Wearing Wrangler Riggs, I also carry a S&W Shield this way. Gotta be honest, I didn’t really find any useful info in this article. It basically says…. “there’s lots of options, pick the one you like best.” Hm. That being said, my LCP2 with integrated crimson laser is carried in the pocket holster Ruger supplied with the gun. Works perfect for me. For my LCP I have an IWB holster, Safari land pocket holster and DeSantis holster. The IWB is good for when you are wearing something woth few pockets and you need to still put your keys and wallet into a pocket. The Safi land is good for smaller pockets as it is closer to the size of the pistol. It’s outer covering helps grab the fabric inside to keep from covering your gun on a draw. I paid $12 for it on clearance which was a great price. The DeSantis is nice as it conceals the shape of the pistol a bit better than the Safari land. It does take a larger pocket but worked great for me. Oh and the guys that say just trade for a 9mm, good luck with carrying it in all situations. I can can throw this pistol into anything. My 9mm sub compact is not nearly as flexible and would get left home during a lot of summer outings due to clothing choices. The DeSantis Superfly in your strong side front pocket. The outline is a wallet, does that trick better than any other pocket holster. That’s due to the flap that can be reversed for either right or left side. I have one for a .38 Spcl snubbie and for a .380 mouse gun. Mostly I carry the mouse gun that way. Including when I carry a full size 9mm openly on the belt. Back pocket carry makes no sense to me. Easiest pocket for a pick-pocket to steal from. Been carrying my actual wallet in my left front pocket since I first got a wallet for just that reason. If I am carrying a small .380 (LCP, P3AT) then it’s in a DeSantis Nemesis pocket holster. If I am going to carry IWB then might as well carry a small belt pistol like a Shield. Vedder pocket locker, I have one for my Sig P365 and one for my LCP2, works great for both guns, depends on type of pants I am wearing. Either way I have 7 rounds of .380 or 11 rounds of 9mm on me at all times. Maybe my read was a bit cursory but I don’t think anyone has mention what, to me anyway, is a perfect mouse-gun holster. Now that tablet sized I-phones are so common, I’ve found that a my black nylon LCP holster so perfectly resembles something someone would put a large-screen I-phone in that it is virtually invisible to prying eyes. When I first bought it several years ago (it’s not a Sneaky Pete and I can’t remember the company’s name), I liked the design but felt it’s size was just a little to large to pass the ubiquitous-phone-case test. Now, however, that’s changed. My original lCP (ver.2 with redesigned trigger), fits perfectly and and I can carry this unobtrusive rig virtually anywhere wearing any kind of clothing without attracting attention. I am partial to Sticky holsters for pocket carry. S&W .38 J-frame works great and with a more ‘baggy’ pocket my Detonics .45 and Sticky is comfortable. Concur with the Sticky pocket holster. My RM 380 is in a Sticky in the right cargo pocket of my pants and a Sticky mag pouch with two spare mags is in the left cargo pocket. Works well, no worries. Any problem using any holsters with after market grips? Sneaky Pete said a Hogue grip won’t fit in their S & W revolver holsters. Glad I read the ‘small print’. I’m carrying my lcp2 right now with only a Clipdraw, no holster. Obviously, I don’t have a round in the chamber. I understand the problems with not having a round ready to go, but I accept this knowing how extremely comfortable it is to carry this way. I’d rather have it on me and not-in-ready state then not have it because it was too uncomfortable which is what I was doing, not carrying it. I bought an urban carry holster, couldn’t draw my thick handle double sided firearm with any consistency. But later when I got a thinner single firearm I pulled out my urban and found it useful again. I have a keltec p3at I carry in one of two rigs. I have a leather IWB holster that works quite well and I have a hip bag that conceals the gun but opens easily allowing me to access easily. There is a secondary pouch that holds a small phone or wallet. The gun is the size of a wallet so pocket carry is a good option and the trigger is long action enough to make it safe to do so if you have an insert to shield it. 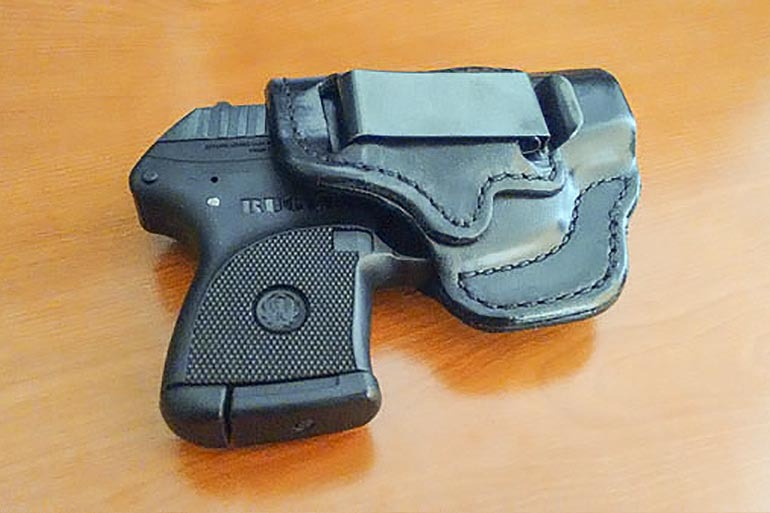 I carry my LCP II in a DeSantis IWB holster specifically designed for my Ruger. I question the author’s insistence on the necessity of a “good gun belt.” The Ruger weighs around ten ounces. A decent belt, yes. A “gun specific belt?” No way. IWB works fine for me with this kind of gun. LCPII in a BlackArch ACE Dri-Matrix IWB. I am usually wearing jeans or dockers and found that the most comfortable holster to carry the Curveball wallet holster since it fits perfectly in my back pocket. Completely masks the outline and doesnt dig into my waistline like my old holster did. I have one 380 and I’m very happy with it. I honestly dont understand folks complaining about not having enough caliber to be a self defense gun. I’d feel comfortable with a 22 if it weren’t for it being rim fire. I guess I just havent been in enough gun battles to know better. Of course a 308 gonna put a lot more hurt on some bad person so actually every thing is sorta a compromise. Oh well, good day. Accidental discharge is a misnomer,it is NEGLIGENT DISCHARGE , know your firearm,and know it well training is key,train train train!!! Pocket carry on my dominant side. Pretty much stays in my pocket 24/7, even when I hang up the pants at night. Works great. Use a pocket holster that stays in the pocket when you draw it. Normally carry something bigger when I go out, so this is usually my backup. I almost forget it is there, except I had to learn not to load up that pocket. The only problem I normally encounter is getting around the knife I have clipped to the other pocket to get my keys. I have the Desantis Summer Heat inside the waistband holster for my LCP Custom. It works great. I also have a pocket holster for when that is an option but use the Desantis more often. It simply disappears. Have carried my LCP with lazer sight since I bought it. As a senior and “heavy set”. I have used an ankle holster most of the time. All were passable but when the Bug Bite came out, I bought one. VERY comfortable. Have had a couple problems but solved them. First it wanted to slide down. Took a strap from another old ankle holster with a hook and loop closer strap and short strap and sewed it on the top. I see new models have some sort of strap. Second is pocket is to large for LCP. I had the weapon pop out when I tripped going into a restaurant. Needle and thread sewing the top a little smaller solved this problem. Zipper has to short a tab. Replaced with a bigger one. Now and then I use pocket holster. get some cargo style pants or shorts.One of my shooting buddies told me to look for a 9mm that would work. manufactures, but they weren’t very helpful. I guess I need HELP. “I have a Walther PPK/s and I can’t seem to find a holster that doesn’t print.” Now you know why so many of us have a box of holsters! Before you spend a fortune, look for a shooting school or instructor who can provide you with an assessment of your concealed carry needs. You didn’t mention anything about your size, weight, body type, etc. This is very important when choosing a carry gun/holster combination. For example, if you’re very slender, that PPK/s can pose a problem since the /s meant that it came with the longer PP grip frame, complete with sharp corners that catch on shirts, t-shirts, etc. Also, you may need to adjust the size and/or style of some of your wardrobe in order to “dress around the gun”. Yes, it’s really a thing!